Last summer, Sen. Jeff Merkley traveled to Texas to find out what was happening at the U.S.-Mexico Border. He heard reports that families who were seeking asylum were being criminalized and detained. Even worse, Jeff was told that there were hundreds of children being separated from their parents. Jeff traveled to the McAllen Border Station where he was given access to the facility. What he witnessed was harrowing. There were hundreds of children being held in large chain-link cages. There were boys and girls being held in separate cages, standing in single file lines, from shortest to tallest. No parents in sight. Jeff visited the Brownsville Unaccompanied Minors Shelter in an old Wal-Mart. These detention facilities are like high security prisons, you can't just walk in. Jeff called the number on the building to see if he could gain access. Someone from the facility answered and told Jeff that the supervisor would come out to meet him. Instead, they called the cops to have Jeff arrested. Jeff’s visit to Brownsville was aired live on Facebook and went viral. After Jeff exposed the crisis, news organizations had wall-to-wall coverage of the family separation policy and eventually got reporters inside, validating Jeff’s description of what he saw in McAllen. The Trump administration attacked Jeff, falsely claiming he was spreading lies, but Jeff fired back attacking Trump’s cruel policy. The response from the American people to the humanitarian abuses was swift and fierce. National advocacy groups began to organize hundreds of protests, including a nationwide day of action. These efforts played a huge role in changing the way we think about the immigration crisis. nce Jeff returned to Washington, he immediately began looking at every option available to stop the internment camps from operating and help reunite the children with their parents. He led a congressional delegation back to the Texas border on Father's Day to shine a light on the cruelty of the policy. He led a delegation with his Oregon counterparts in Congress to a prison in Oregon where some fathers were being held after their kids were snatched away. He put together a letter signed by every Senate Democrat demanding that the Senate Judiciary Committee immediately hold hearings on the matter. On June 20th, just two weeks after Jeff’s first visit to the border, Trump announced they would end their child separation policy. The courts demanded that Trump immediately reunite the children with their parents. The Trump Administration missed the first court deadline to reunify the children, and even worse, they couldn’t locate all the missing children. On June 30th, hundreds of thousands of people took to the streets in a nationwide day of protest called, "Families Belong Together." And seventeen states had filed lawsuits suing Trump over its child separation policy. Instead of child separation, the administration’s new policy was to create internment camps for entire families. It was as if they had forgotten about our nation’s shameful past with Japanese Internment Camps. On September 6th, the administration announced it would sidestep the longstanding Flores court settlement that put limits on how long migrant children can be locked up. Jeff countered Trump by introducing the “No Internment Camps” Act, which would halt the operations of prison-style camps for migrant families. Jeff traveled back to the border in December with Sen. Smith, Rep. Chu and Rep. Beto to the Tornillo detention center, a tent prison camp that was holding 2,700 children. These places should never exist in our America. Nearly half of the children locked up in Tornillo had sponsors ready to take them but the administration created bureaucratic delays to keep them locked up. 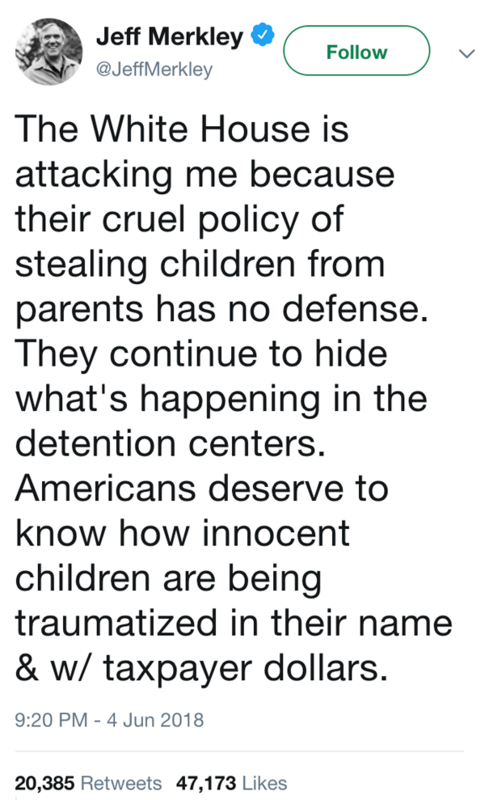 Jeff also visited detention centers in Dilly and Karnes, one of which was a medium security prison where they kept the innocent children. After the visit, Jeff and Rep. Chu introduced the Shut Down Child Prison Camps Act, a bill that would effectively shut down Tornillo and other child prisons like it. As pressure continued to mount, Trump announced last week that they were shutting down Tornillo. 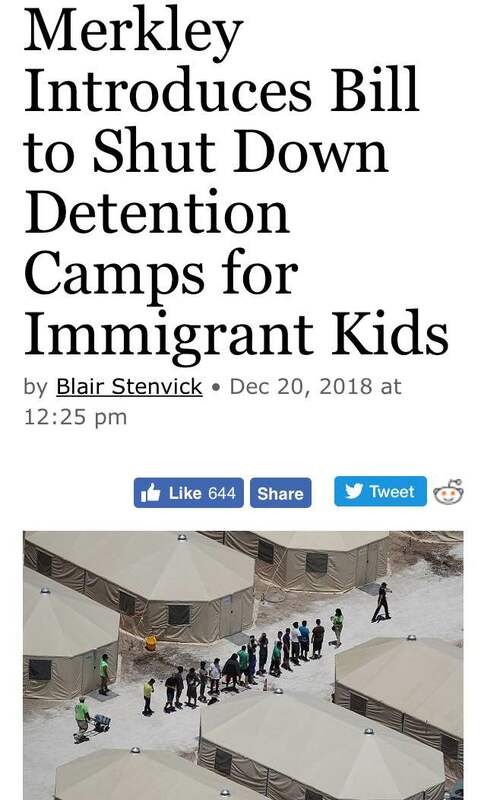 It was a victory for those kids but there is still so much work to do. There are thousands of children locked up and many more who have not been reunited with their parents. And more quietly, the administration has been expanding capacity at the other emergency prison in Homestead, Florida. Last week Jeff received a leaked document from a government whistleblower showing that the administration had deliberately planned to traumatize children and create a crisis at the border. Going back to 2017, the administration devised a strategy to separate children from their parents and lock them up, characterize anyone coming to the U.S. with their kids seeking asylum as “smugglers,” and to create obstacles for potential sponsors. 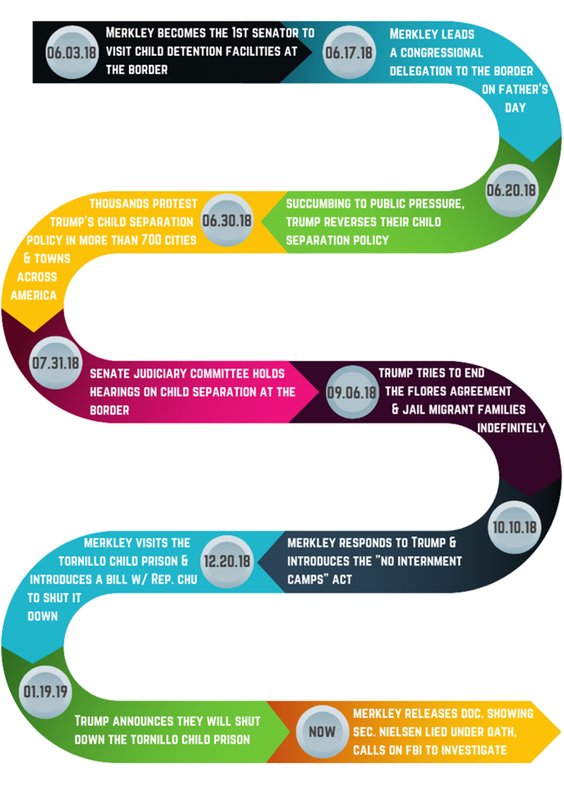 It was a roadmap for all of the policies that we saw throughout 2018, to intentionally terrorize families for the purpose of deterring future asylum seekers from coming to the U.S. The document also provided evidence that DHS Sec. Nielsen lied during her testimony to Congress when she claimed they never had a policy to separate families. Jeff wrote a letter to FBI Director Wray calling for a perjury investigation into Sec. Nielsen. It’s bad enough that the administration put this awful policy in place but then to lie to Congress and the American people about its existence? Shameful. While Jeff helped put an end to Trump’s cruel child separation policy, there is still so much work to be done. 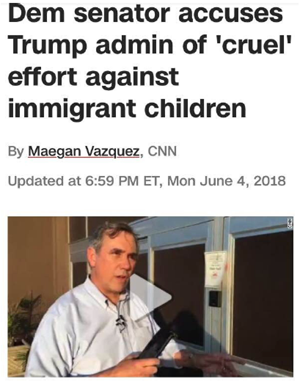 Jeff will not rest until every last child has been reunited with their parents and administration officials are held accountable for this moral disaster. We can never let this happen again. Not in OUR America.